After completing work in this community, we made a brief detour into Palm Valley for lunch. This was my favourite thrill-a-minute four-wheel drive road. Not only was it an adrenaline rush because it was so challenging, the landscape was stunning and ever-changing. We didn’t have time to walk deeper into the valley, but the road itself and the flowers along the way more than compensated. After being forced to drive past many fuchsias on the roads north of Alice Springs due to time constraints, I became a little obsessed with fuchsias for the rest of the trip. I found myself searching for a black and white fuchsia that I kept seeing in my mind. I couldn’t work out what it was and why it seemed important. Perhaps it was one Grandma had shown me as a child. Fuchsia was one of my grandmother’s favourite flowers and my grandparents had loved visiting Palm Valley, so it felt special to find my first fuchsia here. The botanical name for the desert fuchsia genus is Eremophila, which means ‘desert lover’. As I connected with this fuchsia, I felt my energy field expand, lift, and soften into a profound sense of humility. This feeling seemed to encompass and underlie every other impression that followed. Humility Fuchsia helps people come face to face with dark emotional shadows they aren’t consciously aware of, especially rage. 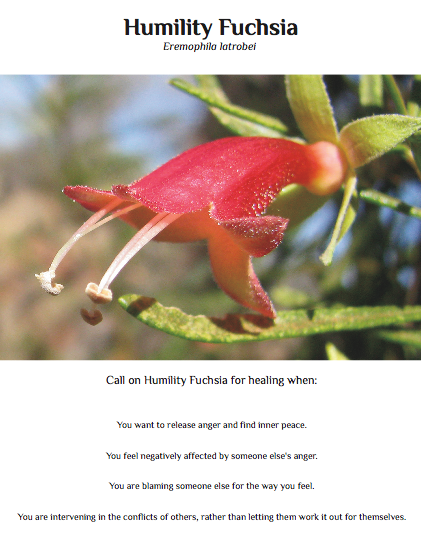 When I connected with Humility Fuchsia, it held a mirror up in front of me so my rage could see and recognise itself. Coming face to face with your own rage might sound intense, but Humility Fuchsia softens the blow by evoking a humble feeling of detachment. With Humility Fuchsia’s support, I searched my soul with honesty, acknowledging the emotional choices I had made in my life. In that calm moment of self-recognition and self-acceptance, I realised my rage was unnecessary and I let it go. By helping me in this way, Humility Fuchsia laid the ground-work for an experience I had a few months later during a sound therapy workshop I attended. Hearing other people releasing rage made me feel so unsafe, that I curled up in a ball and put my hands over my ears, instead of participating. The facilitator came over to me and insisted I make noise. At first the sounds I made were sad, because as a child I often felt tormented by anger being directed at me, and there was nothing I could do to protect myself or make it stop. I realised I felt angry about this because it seemed so unfair. When the angry people in the workshop wouldn’t stop yelling, I eventually got cross and yelled back. I felt like I was like saying: “I exist, I have a voice. I have a right to be heard. I can get angry too!” I was pushing their anger back with my voice, because I needed space for my own self-expression. After tapping into my own anger, I began to feel more at peace with the people in the workshop who were expressing anger. I stopped. It was Mother Mary. Do not interfere with his parenting process. I am here for him, not you. Do not do to him what his mother did to his father. I finally understood. My anger dissolved and I was able to stay put, allowing my husband and son to resolve their differences without my interference. This excerpt is from my book Wildflower Spirit Journey. If you would like a copy of this book, please help me raise funds for publishing by supporting my crowd-funding campaign.